We talk about having business intelligence and gathering data as the all important seed for business success. Information intelligence and knowing your company strengths and opportunities is necessary for sure but take a moment to look at your internal business processes. We witnessed a humble process that happens in every business, cleaning the floors. Alsmost no process is to small to improve. In casual observation at a standard facility it was noticed that a particular cleaning person would get a broom and sweep everything into piles. That is fine and we all would do the same thing, grouping the dust and junk to a pile and pick it up. This is where the process seemed to break. The custodian never brought a dust pan. How did this affect the process? What where the ramifications? The custodian would have to go back and get the dust pan leaving the piles along the corridors and hallways. People had to go around the piles, they looked unsightly and of course the work was only half done. The person had to travel to each area twice instead of once. Sure they were busy but the hallway had the appearance of not being clean on a regular basis. Appearance is reality! The simple act of bringing the dustpan resulted in areas being cleaned and the piles were not left for people to go around. The impression was a new cleaning company must have started. The custodian got done quicker by saving on the extra trips to the cleaning closet. Fast forward to a year and all those minutes add up to a cleaner place with less effort because a simple change was identified and implemented. What business process can you improve today? If you received an email with any thing similar to the below information it is pure junk mail. I am Dr. Martin Vermont and I work for Multilingual Search Engine Optimization Inc. in Washington DC ( Tel: 1-202-558-2504) – I would like to speak with the person in charge of your international clientele. Who is my contact? Who should I speak to?? In fact, after visiting “your domain would be listed here” , I have noticed your website cannot be found on foreign search engines (I tested it on Hispanic search engines, German search engines, Asian search engines, etc.) Our company is specialized in multilingual search engine promotions in 28 languages . From the Japanese Google to the German Yahoo, from the AOL in Spanish to the MSN in Chinese, we can show you how to develop a true international online presence by promoting your website on foreign search engines. Please call me at (phone number removed) or email me and let’s work on giving your website the true international exposure which it deserves to have with foreign native online users!! Multilingual Search Engine Promotion Services (apparently spamming) since 1999. Could someone in DC go to this office and verify they actually have an office? That would be different than the common sleaze. Here is a suggestion from one innocent user who received this email: Ship them some junk. Put some trash in an envelope and send it to them. Move over Google? MSN search lab’s tools! We all love Google for the good they bring, the summers of code and other great projects they helped move forward. They have some good tools and here are a few tools that can be used by the average business owner without needing a PHD in computer terminology. We purposely will not look at the adwords, adcenter or any tool that requires a login or account before you can use the tool. Everything listed here is free for use and not to difficult. First up is trends. What are the search trends for your industry, product or service? Hop right over to Google Trends and start searching. www.google.com/trends You can combine multiple search terms with commas and see how they compare. Put competing companies up on the search as this can be very informative. If you are a stock trader this is a fantastic tool and gives you a view not seen by the standard stocastics tools for stock picks. The view compares several years so you get a big picture view including major news and associated search peaks. Look up your search data and think about the low spots. Did you spot a trend? What can you do to help your business avoid any valley shown in the metric results? MSN offers several tools in the question of search relevance and search value. 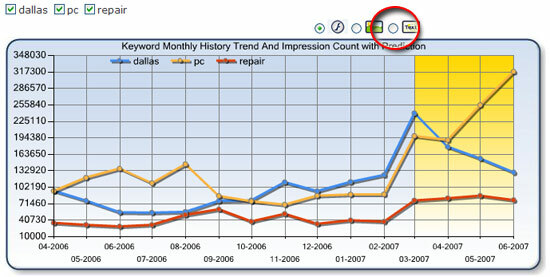 Keyword search group is a tool to help you with related terms for your search. Our tests honestly did not reveal much and pretty much only worked with single words not phrases. Try out the keyword funnel tool. It means keyword not key phrase. Type in 2 a word phrase and don’t expect to get results. Single keywords work well unless you sell something like windows where obvious conflicts between software and actual windows come into play. The MSN keyword mispelling tool is very weak. It will catch a few but we know from actual web logs the results from the tool are just not very thorough. There is value in how easy it is but we wanted more from the search results. The MSN keyword forcasting tool is nice, has good metrics and gives an interesting view of search consolidation for multiple terms. Be sure to click the “text” link shown below for a numeric view of the results. We like numbers!! Here is a link to all the MSN tools so you can do some quick data mining. MSN Free Search Tools. There are many additional tools and search professionals available. Find someone you can talk to in your own timezone and armed with some information from the search tools above you will really help your SEO company take you to the next level. You can do a lot yourself but a professional will let you go run your business while helping achive your online search goals.